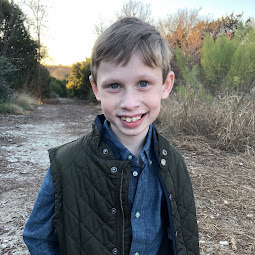 Bennett Brinson Gamel: Fighting Cystic Fibrosis: "Training the Ninjas"
Since Bennett's surgery in February, we have been focused on addressing Bennett's residual bowel issues through pelvic therapy. 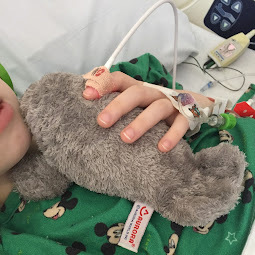 When we were in the hospital for Bennett's latest rectal prolapse surgery/colon resection, one of the pediatric surgeons I really like had a very early morning heart-to-heart talk with me. She explained that, as a pediatric surgeon, she was highly concerned that Bennett has had so many rectal prolapse surgeries. "Four surgeries and the child is only 6 years old? I'm really concerned something else is going on" she told me. In that conversation, she pushed me to look further and not settle for believing this is purely CF issue. It was both alarming and reassuring to have this particular conversation. It felt good to know that somebody else feels like this isn't ok nor is it normal. But it felt scary to see how clearly uncomfortable she was with how he is doing. 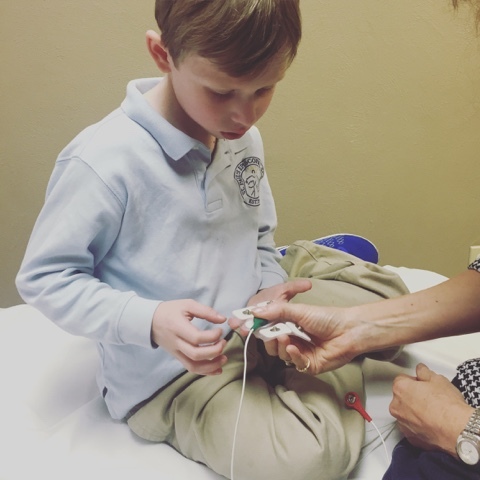 When Bennett left the hospital, our follow-up plan was to allow him to heal, to do some bloodwork and to begin pelvic therapy. Everyone agreed that his body was going to take some time to get back to it's normal again. The bloodwork would reveal celiac or other markers of bowel inflammation. The pelvic therapy was to evaluate and teach Bennett's pelvic muscles to work correctly. Thankfully, the bloodwork showed Bennett does not have Celiac disease and no markers for bowel inflammation. That's why, for now, our attention has been on utilizing his pelvic therapy sessions with a physical therapist. 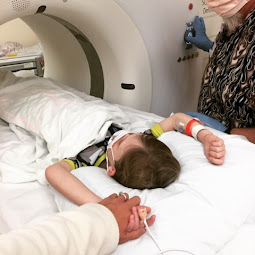 During his second pelvic therapy session, Bennett was given electrodes (stickers with little metal buttons on him) which were connected through wires to a computer. 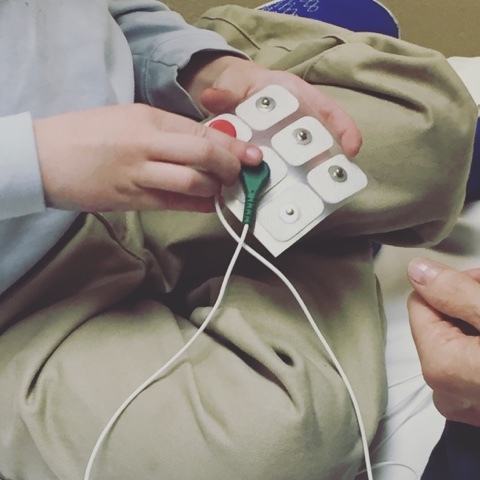 The physical therapist let Bennett connect the electrodes to give him a sense of confidence during the process. 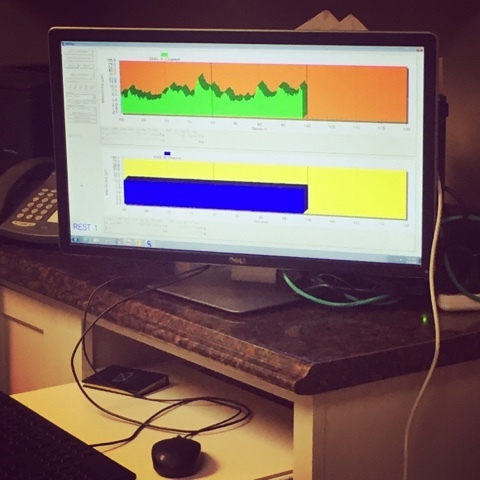 The way biofeedback works in pelvic therapy is that the computer shows when the body is acting or responding. Halfway through the session, Bennett had a ah-ha moment. He stopped and said, "oh, I know what we are doing! We are big and it is small" (meaning we, the people, are big and it, the sphincter muscles, is small). "We are training, like we are the masters...training the ninjas." I wanted to laugh so hard. What a sweet child-like way to put in to words what we were doing. Yes, we were retraining the muscle. And yes, it was as if we were masters simply training the ninja. 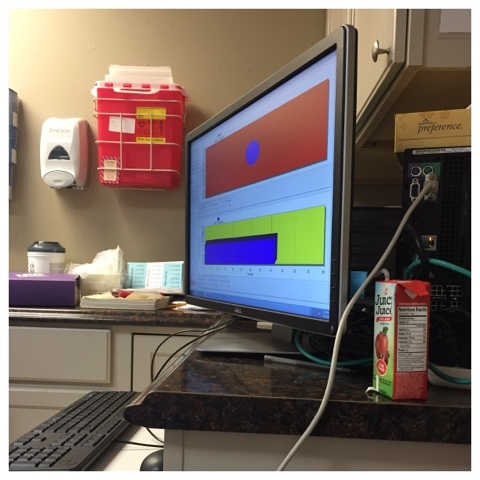 At our third pelvic therapy session, the physical therapist used a different screen. This time, she used the electrodes to work on "opening" and "closing" the sphincter muscle. This was represented on the screen with circles. When Bennett "opened" his sphincter muscle, it caused the circle to get bigger. The opposite happened when he closed his sphincter muscle. It was a great visual for a kindergartner to use to connect what he was doing physically to what the therapist wanted him to do. At the end of the session, the therapist had Bennett sit on the potty. She noticed he doesn't have good posture on the potty. 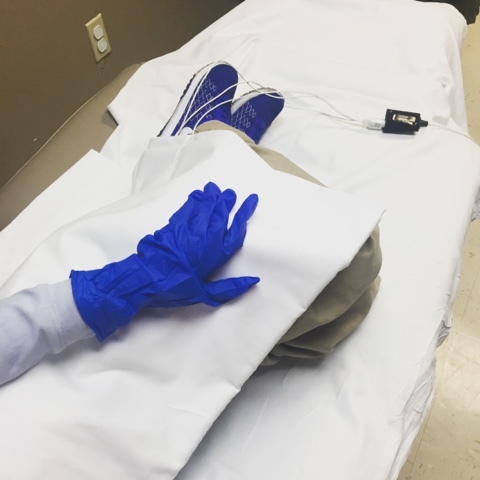 Although he is trying to help himself be more comfortable and "help the poop come out," she says his posture needs to be changed so he can help him be more comfortable and to minimize the strain on his body. The therapist asked me about the height of the stool is that Bennett uses on the potty. She also pushed to make sure he is relaxed on the potty and sitting more stable. It is her believe that these things influence his issues with rectal prolapse. Overall, I think pelvic therapy is good. It seems like these kinds of things would be obvious - open your body and poop comes out. But, from what I understand, the body's elimination process is quite complex so things can easily get mixed up. Something that came up during our last pelvic therapy session is that the therapist is concerned that his poops are not quite right. She has suggested that we bulk up his poop with fiber. She's also wondered if his bowels are not fully emptying itself when he has to go. 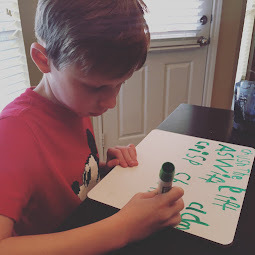 This, on top of a comment from his kindergarten teacher last week about how much class he misses each day due to being in the bathroom at school, recently emphasized even more the conversation I had with the pediatric surgeon several months ago to really push to find out what's going on with Bennett's GI issues. The CF GI doctor, Brian and I are considering putting Bennett through a more tests to investigate what is going on. It's SO hard to want to do more tests when our entire family is tired of the pokes, the pricks, the tests and the results. But we also don't want to miss it if there is something we can do to improve his health and quality of life. Praying for light on this issue! I hope they find what's up so dear Bennet can live a less stresfull life.